Raids and sieges; trench warfare and air campaigns; guerrilla warfare, naval engagements, and colonial wars—American Battles & Campaigns covers every major campaign and battle fought in North America or by United States’ forces overseas, from the Pequot War of 1634 to the recent conflicts in Afghanistan and Iraq. 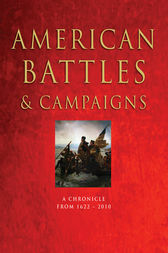 Arranged chronologically, American Battles & Campaigns: A Chronicle, from 1622-Present includes hundreds of entries, ranging from the 1770 Boston Massacre through the Alamo (1836) and the Philippine-American War (1899–1902), to Chateau-Thierry (1918), Midway (1942) and Hue (1969). Major battles, such as Yorktown, Gettysburg, Pearl Harbor, and D-Day, are illustrated with full-color annotated 3-dimensional maps and detailed text explaining the course of the engagement. Stuffed with black and white and color photographs, battle maps, paintings and other artwork, American Battles & Campaigns contains expert accounts and analysis from thirty leading military historians. CHRIS MCNAB is an author and editor specializing in military history and military technology. To date he has published more than 40 books, including A History of the World in 100 Weapons (2011), Deadly Force (2009) and Tools of Violence (2008). He is the contributing editor of Hitler's Armies: A History of the German War Machine 1939-45 (2011) and Armies of the Napoleonic Wars (2009). Chris has also written extensively for major encyclopedia series, magazines and newspapers. He lives in South Wales.